Cat Cvengros, MBA, Development Director of Social Advocates for Youth (SAY) will be our speaker today. Cat will talk about the proposed Dream Center that would be located at the retired Warrack Hospital in Bennett Valley. Sutter Medical Center of Santa Rosa (SMCSR) generously offered to donate the former Sutter Warrack Hospital building to SAY with the goal of building on SAY’s 42 year history and expanding SAY’s capacity to serve more of Sonoma County’s youth and families. This donation saves SAY millions of dollars in purchasing land and construction costs of a building. Come here what is planned for SAY’s new Dream Center. President Peggy began today’s meeting of the “Finest” Rotary Club in District 5130 with her usual beautiful smile! Gary Vice whipped the crowd into shape by leading us in the Pledges of Allegiance. The Invocation was led by Jack Tolin, who led us in a short prayer recognizing many areas where Rotarians should give thanks, such as for food to eat, but not to forget those who are hungry in our community: for having friends where some do not: for being free in America where other people around the world are not: for those Veterans who made the ultimate sacrifice to achieve our freedom in the good old USA: for our men and women currently serving in the military for keeping our country safe, and finally for all service club members, including Lions and Kiwanians! Jane Duggan was supposed to announce our fellow Rotarians, but unlike our program speaker, apparently was not able to find our secretive meeting today. Prez. 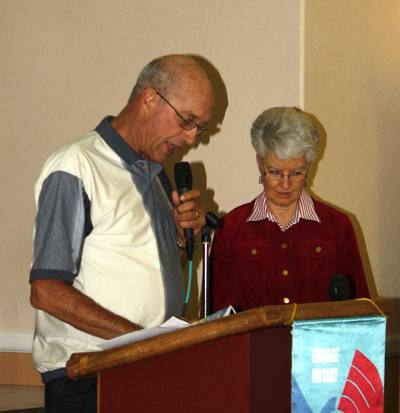 Peggy introduced our speaker, John Blount from the Sebastopol Rotary Club. Penny Tibbets had no cloudy news to report. It was noted, however that Nick Knickerbocker’s wife, Camille, has returned home from a stay in the hospital and Sonja Butler is back on her feet again and was at our meeting! Sooo, that’s why the clouds lifted by the time our meeting started today! Rich De Lambert introduced Terri Derr of Cardinal Newman high school, rumored to be Mike Truesdell’s replacement in our club. Cross our fingers that Terri joins the club soon! Sonja Butler, freshly back on both legs introduced her husband, Scott of Tiger Kick, a local martial arts teacher and company owner. Past President, Marnie Goldschlag, introduced her husband Sgt. Eric and Lt. Mike Tosti both of our Santa Rosa Police Department and also soon to become club members under our Corporate Membership Program. Dan Schell nicely selected this editor’s ticket, but alas, the pot of over $700 continues to grow as I was close, but no cigar in picking the King of Clubs instead of the Joker. One would think that would be the natural card for me to draw, no? In any event, Jane Duggan, who sold me the ticket didn’t get the $10 prize, although she did convey after the meeting that she was due $5 for assisting me in getting at least the $10 semi-reward instead of her…..
“Uncle Dan” Walker alerted us to a party at his house tonight to plan the annual Holiday Poinsettia Project. Ted Wilmsen gave fair warning that the last date to submit applications for grants from the Joint Charitable Projects Committee of our club and the foundation is Halloween. Debi Zaft, before starting to whine about not having purchased (yet) a ticket to the Veteran’s Luncheon, announced that the monthly social at Wayne Rowland’s house last night was nicely attended. Sam McMillan related how the sales of the Sonoma County Fair pigs and lambs fared last night (sorry, but I couldn’t resist such an opportunity.) Sam mentioned that there are still some piglets running around needing a freezer to reside in if club members wanted to pony up (again, sorry!) and finish off the annual auction of meat raised by the FFA and 4H’ers. These are former pets who made the ultimate sacrifice for their owners. Past Prez, Remundo Dorfman chastised Debi Zaft for waiting until the club’s 150 tickets for the Veterans Luncheon were sold out to finally try to buy a ticket. Great job club members for yet another complete sell out of tickets for this event. Apparently as this went to press, it was rumored that a ticket might be scrounged up for Debi. FINES AND RECOGNITIONS AND THE BIG BARBECUE SOCIAL AND MEAT AUCTION AT WAYNE’S HOUSE………..
Wayne Rowlands’ home was again the site of a barbecue and social where Rotarians had the opportunity to bid on cuts of pork and lamb that were purchased by the club at the Sonoma County Fair from 4H youths. President Peggy showed photos of the happy event and it was noted by someone that Jack Tolin has redefined the term “slow food” by finally picking up his order from LAST YEAR! Jack, thoroughly and appropriately embarrassed, agreed to donate $50 to our Club’s Foundation. Gratefully, he did not try to donate the 2012 meat. When last seen, Jack was skulking off to his car with two years’ worth of squealing meat, thereby getting a faster jump on possession of the “new meat” he purchased last night. Past President Bill Pedersen was “recognized” by Prez Peggy for an article (written apparently by one of the four generations of the Pedersen family in the local furniture business) extolling Pedersen’s Furniture as the best of Sonoma in that category. His company is alleged to be the oldest family run business in our county! Bill coughed up $100 to the Club for that award, recognition and self- promotion. Sergeant at Arms, Jack Geary, was recognized for a photo depicting Jack and another Board member for Jack’s service as a Board Member on Disability Services and Legal Center of Sonoma County. Jack was cajoled into giving $50 to our Club after he figured out how to turn on the roving wireless microphone. Dr. Nicole Le aka (Stavko) dropped in and graced us with her charming presence (and picture taking abilities). President Peggy started off with a picture of Nicole’s new baby and then showed another photo of (supposedly) Nicole after being “made up” in connection with what appeared to be the wedding of Nicole’s sister in Hawaii. Nicole announced that the dental practice she and her husband John own and operate has expanded into Cloverdale as of September 1st. Thus, it appears that we have another “Wonder Woman” in the Club (in addition to Shannon McConnell, the daughter of yet another Wonder Woman, Jane Duggan) of our Club as she juggles two kids, a thriving “drilling” practice and Rotary! Whew!, I’m tired just reporting on this!. Oh, BTW, Nicole has graciously donated $100 to the RI Foundation to take advantage of the Club match! Mike Kalhoff, head honcho at United Way in Sonoma County was recognized for his recognition by the North Bay Business Journal as one of 13 non-profit leaders in our community. Way to go, Mike! After a $25 donation to the Club, Mike announced his plan to become a “Wonder Man” by attending Jack Geary’s organization’s recognition breakfast and then attending the function where he will be recognized – all in one day. That’s a lot of rubber eggs and chicken to consume in one day! (if only it were that easy, Mike! John Blount put aside his own drilling practice today and revisited his favorite club to do a make-up at. 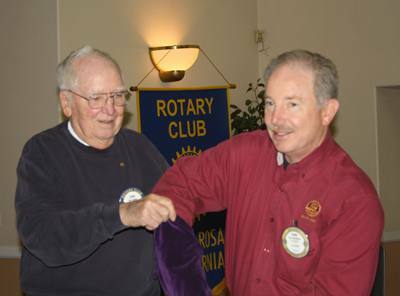 John has been a dedicated Rotarian for 37 years and counting, having served as his Sebastopol club’s President and the District’s Assistant District Governor and District Governor. John was then honored by being selected to be a Rotary International Director for our Zone. 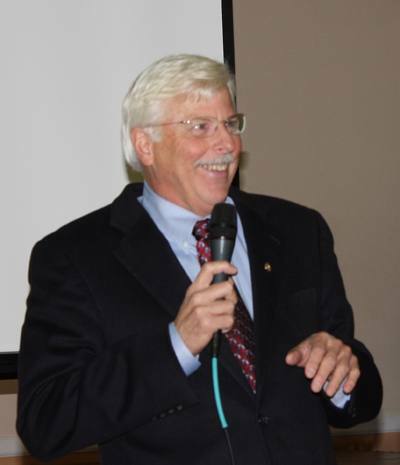 John related that Rotarians normally have a sense of civic pride when they join a Rotary club. He sensed that with our Club especially. He also noted that our Club had a different look than years before such as we are younger, more diverse, and enthusiastic about Rotary. He explained that Rotary is undergoing an accelerated rate of change matching changes in the business world. His message: companies and Rotary have to continue to evolve from staid, conservative, stay the course organizations or they will become the Kodak of the future instead of reinvigorated companies such as Apple, Ford, and even the Pittsburgh Pirates! In essence, Rotary (to quote Dan Quayle) is on an irreversible course, although that could change! Rotary has evolved from the early and mid-1900’s by becoming international, adding the Group Study Exchange, Ambassadorial Scholars, Peace Scholars, Camps for Kids, and Youth Exchange programs, to name just a few innovations. Recently, Rotary has been able to maintain its membership levels and also show the promise for net growth to 1.1 million members, but mostly from growth in clubs in the Far East, India, and Eastern Europe. North America, however, remains a problem due to a net negative growth which has seen clubs bleed in membership. We are able to attract new members. In fact, 70% of guests become members. However, 50% of those who join leave Rotary within 3 years. John posed the question: how does Rotary itself and more importantly the individual clubs reverse this trend? He suggested the answer is serving our customers (club members) better and recognizing the two main reasons why people join Rotary: relationships/fellowship and service. Rotary needs to reemphasize its brand: commerce and causes. We were reminded that after 28 years we are extremely close to eliminating the second disease in the history of the human race: Polio. Currently, India is non-endemic: for 2 years!! And in Nigeria and Afghanistan, reported polio cases have dropped by 50% in each of the last two years running. John asked rhetorically: what happens after Polio is eradicated? What will the Rotary International “home office” look like? Will there be budget reductions, reductions in staff, etc.? John said that the answer is out there somewhere currently in the individual clubs. What is the roadmap for change? John said he thinks it already exists in the recognition of the 5 core values of Rotary: Relationships/Fellowship (have fun and do business together); Ethics/Integrity; Leadership (assess and take action); Diversity; and Service. John reported that the RI website is in the process of being modernized through the leadership of the new Secretary General. Some changes have been already instituted most recently with more to come in the next 9 months. John ended his talk by encouraging all clubs to be receptive to degrees of change as Rotary continues to evolve along an irreversible path!